The information concerning the difficulty and signing of trails is provided in a tourist map in front of the hotel. The hotel offers a pleasant wellness centre where your can rest, regenerate and relax your body and enjoy more activities all year round. The observatory stands on a hill of the same name in the land register of Seninky 651m above the sea level. It is 3km far from the hotel Sirákov, which makes it an ideal goal of family trips. The designer of the observatory is a Zlín architect Ivan Bergmann. The cylinder-shaped iron observatory is 37m high. Its outlook platform is at the height of 35m and it is covered by a roof. This building is a dominating feature of the region of Hornolidečsko, Vsetínsko and the whole shire of Zlín. Its visitors may enjoy spectacular views of mountain ranges Vsetínské vrchy, Hostýnské vrchy, Vizovické vrchy, Beskydy and some Slovak mountain ranges. In a nearby Slovak village Dohňany on the mountain Tlsta hora, there is another observatory tower. An interesting fact is that both hills where the observatory towers stand today were used for patrolling the surroundings in the past, too. While Vartovna served as a guard mountain, where warning fires were set in the case of approaching danger, on mountain Tlsta hora there was an Austria-Hungary watchtower for army purposes. The town of Vizovice is situated at the foot of the mountain range Vizovické hory. In the past, there was a seat of a monastery Smiheim, founded in 1261 that belonged to the order of Cistercián. In the place of the abolished monastery, a renaissance chateau was built and, two centuries later, it was rebuilt into a baroque chateau with prominent features of French classicism. You may visit the distillery company RUDOLF JELÍNEK, a.s. As a part of the excursion, the visitors will be shown a short film about the company. Then the visitors will admire the most modern appliance for spirits production in the Czech Republic, huge wooden barrels for the maturing of distillates and a filling room where finished spirits are filled into bottles. All guests are allowed to taste 4 samples of chosen products and they will receive a gift miniature of Slivovitz bottle. The company store offers a great variety of products at favourable prices. The grounds of the ZOO are divided into zoo-geographical regions, so that the visitors will meet typical and best-known animal representatives of different continents (Africa, Asia, Australia, South America, and Eurasia). The ZOO has a beautiful historical park and variegated natural environment with many ponds, running streams, waterfalls in animal expositions, and fountains at water reservoirs. The landscape is covered by variegated vegetation, counting nearly 600 species of bushes and trees. Pulčín is the highest-situated Walachia village. It was mentioned in historical records of the 15th century, but abandoned in 1517. In 1574 it was rebuilt in the place where it stands now. In 1663 it was burned our by Turkish. In 1818 the listed stone cross was built. North of the village, there is a National Natural Reservation Pulčín-Hradisko. Sandstone crest rock town. A fissure cave on the top of the hill. Just before the village of Horní Lideč at the direction from Vstetín, in a glen above the river Senice, there is a unique huge bizarre sandstone wall Čertovy skály (Devil’s rocks). This protected natural creation consists of huge stones, is from 6 to 20m high, 2-3 m wide and the wall is 130m long. In the 1st century B.C., there was an ancient settlement on the top of the hill Zámčisko The origin of Devil’s rocks is explained in a folk legend about a bet between a clever Walachia miller and a devil. Another legend says that a wizard used to appear near here, who brought poor people into caves under the Rocks and gave them gold. The first stronghold here was probably built already in the 14th century. The first written record comes from 1464, during the reign of Václav z Doloplaz. 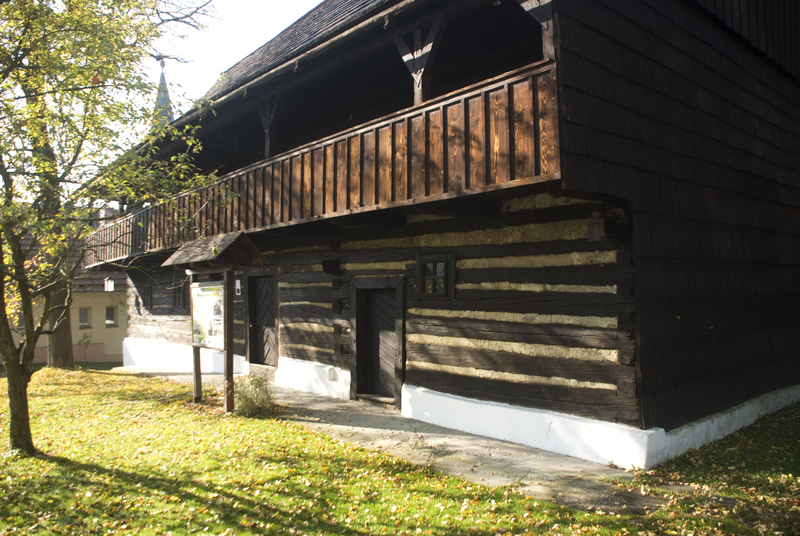 In the middle of the 16th century the stronghold was acquired by the family of Nekešové z Landeka. Either they or their heir Arkleb z Vickova enlarged the fortress to a four-wing renaissance chateau. During the Thirty Years’ War there was a Walachia uprising, which was defeated in 1627. Between 1652 and 1827 the chateau belonged to a Hungarian family Illéshazy, who started to build a new seat in the southwest direction from the original chateau in 1656. It should have looked like an Italian castellum with corner towers and matched the architecture of the Illesházys’ mansions in Hungary (the building works were organized by A. Cavado); however, in 1680s the unfinished building was changed into a church. The original chateau served only as a seat of officials. It was conquered and burned out by a Hungarian army led by František Rákoczí II in 1708. Not before 1732 and 1733 was the chateau rebuilt and modernized in baroque style. More, classicist adjustments were performed by the family of Wachtler in 1833 and 1834. The last owners of the chateau were Thonet between 1890 and 1945. After a fire in 1915 the chateau was altered in pseudo-renaissance style. Today, the chateau is a four-wing building with polygonal corner towers and a stout, 55m high prismatic tower above the entrance frontispiece. Remains of renaissance vaults on the ground floor, plaster decorations on the first floor. A former merchant house built at the beginning of the 19th century has become a collection of Walachia folk architecture. Ethnical collections: Walachia cuisine, agricultural tools, processing raw materials, cutting shingles and torches, wood-carving, folk costumes, pressed and blown glass. The history and personalities of Velké Karlovice; painters from Soláň; expositions of paintings. The family of Žerotín built a renaissance chateau in the middle of the 16th century as a replacement of a ruined castle in Rožnov pod Radhoštěm. In 1648 it was damaged by Swedish. At the beginning of the 18th century, the family of Žerotín from Vizmberg rebuilt and extended the chateau in baroque style. From 1805 to 1815 it served as an army hospital. In 1815 it was acquired by the family Kinští. However, when they had chosen a new seat in Krásno nad Bečvou in 1854, they sold their old chateau to the state authorities. 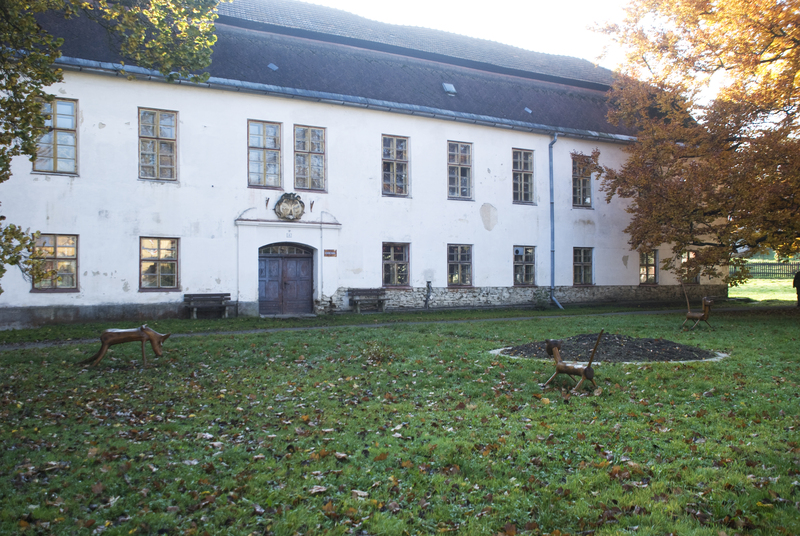 The building then served as a women prison, during the 1st World War as an army hospital and later as barracks. Today, it is a two-storey, three-wing building with partly glass-covered baroque arcades on the ground and the 1st floor and with the remains of plaster decorations and wall paintings. RAn extensive complex of folk buildings and Walachia sights, founded in 1925. At present there are more than 70 objects in three sections – Wooden town, Walachia village, Mill dale. Inside equipment of the windmill, including beam frame, was brought to the museum from the village of Kladníky u Lipníka nad Bečvou in 1985, where the original mill was built by František Skopal from Soběchleb in 1829. Some of its parts were taken from even an older mill. It is obvious from assignation in different places of the mill. For example, the beam is labelled by 1812, the flour-box by 1828, and the weathercock by 1813. After the war, the mill decayed until its inside parts were brought to the open-air museum in Rožnov pod Radhoštěm. The outer sheating has stayed in Kladníky in the middle of an orchard. According to it, the new sheating was made in the open-air museum to contain the retouched equipment and the mill was opened to the public. Unfortunately, the placement of the mill in the open-air museum is not appropriate. Its surroundings are completely overgrown by vegetation, so that the mill can not be seen as a country dominant or an important landscape component. However, both the building and the inside equipment have been repaired well and provide much information and knowledge about miller technology. The mountain settlement Pustevny got its name after anchoret (in Czech poustevník) that lived here. The last of them died in 1874. Today, Pustevny is an important centre of tourism. It is dominated by wooden buildings built in folk style by a well-known Slovak architect Dušan Jurkovič.